Living near the water has historically been—and is expected to remain—desirable, yet this choice has inherent risks. Communities face the challenge of determining where and how to accommodate growth and redevelopment given the risks posed by coastal hazards. In tandem, smart growth and hazard mitigation strategies can help communities meet their quality of life, safety, economic, environmental, and transportation goals. 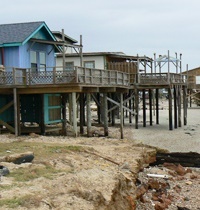 The following resources provide a starting point for learning more about hazard mitigation and implementation of hazard resilient coastal smart growth. This section provides peer-to-peer case studies demonstrating hazard resilient smart growth.